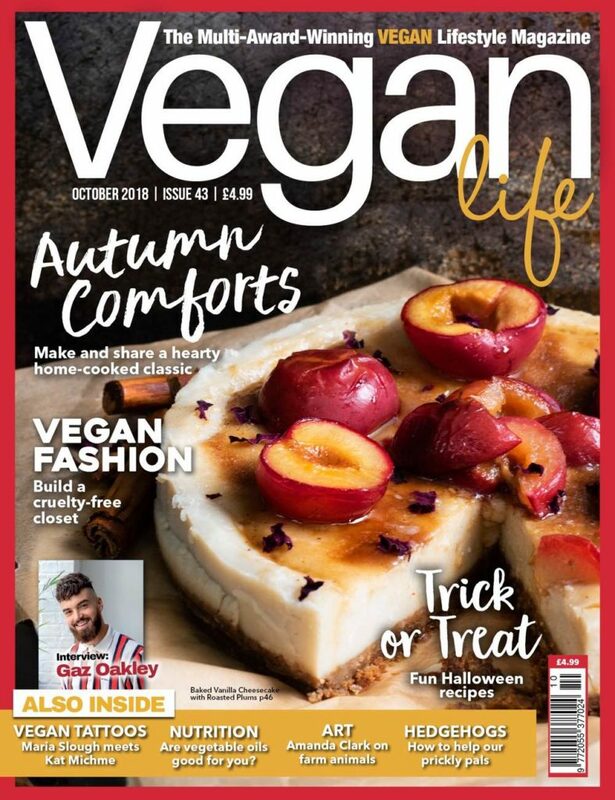 The all-day breakfast recipe that I’m sharing was inspired by Gaz Oakley’s (Avant-Garde Vegan) and Linda McCartney Foods ‘The Morning Avo’ Breakfast Recipe’ which featured in the October edition of the Vegan Life magazine. 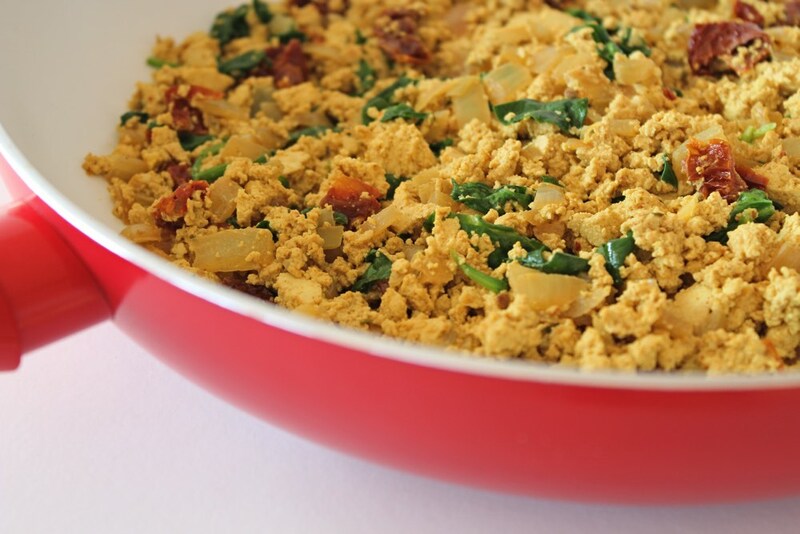 scrambled tofu (to which I added onion, garlic, sun-dried tomatoes and soy sauce to ramp up the flavour) …. 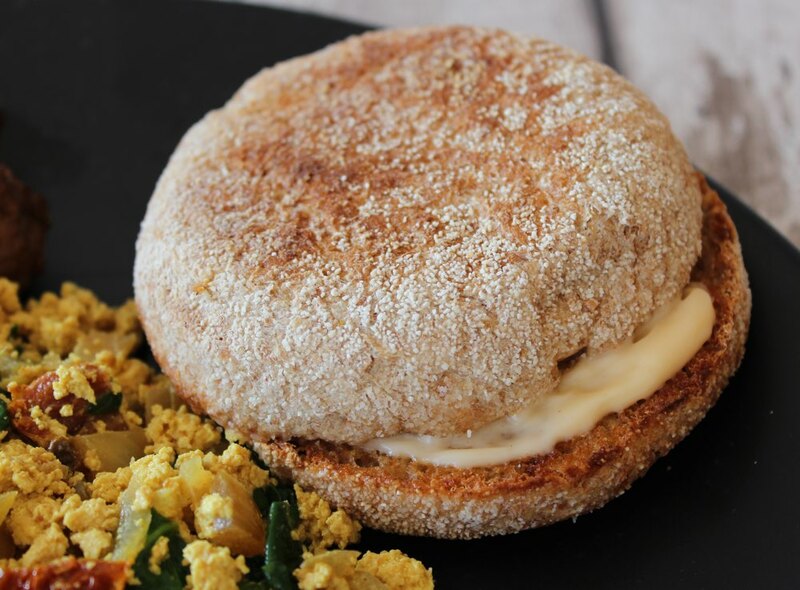 avocado and toasted wholemeal English muffins. 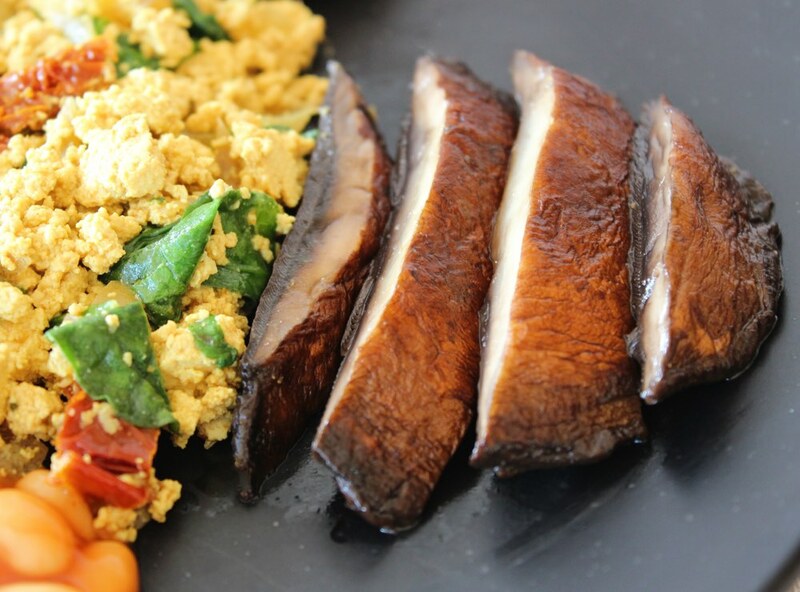 Since my son isn’t a fan of fresh tomatoes, I added some sun-dried tomatoes into the scrambled tofu instead. This worked a treat! 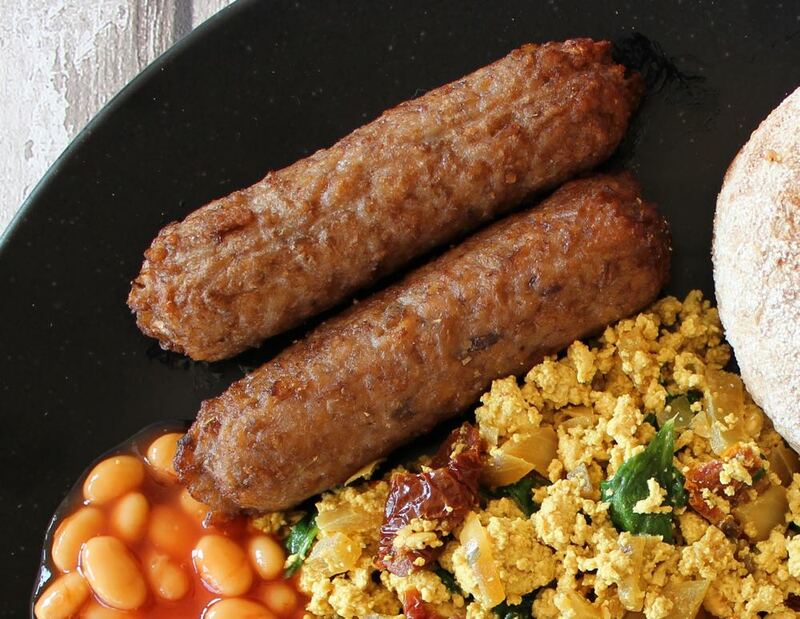 This vegan all-day breakfast is suitable for serving as an evening meal or weekend breakfast, brunch or lunch. Though there are a few components to this meal, it’s really easy to make and takes no more than 30 minutes. 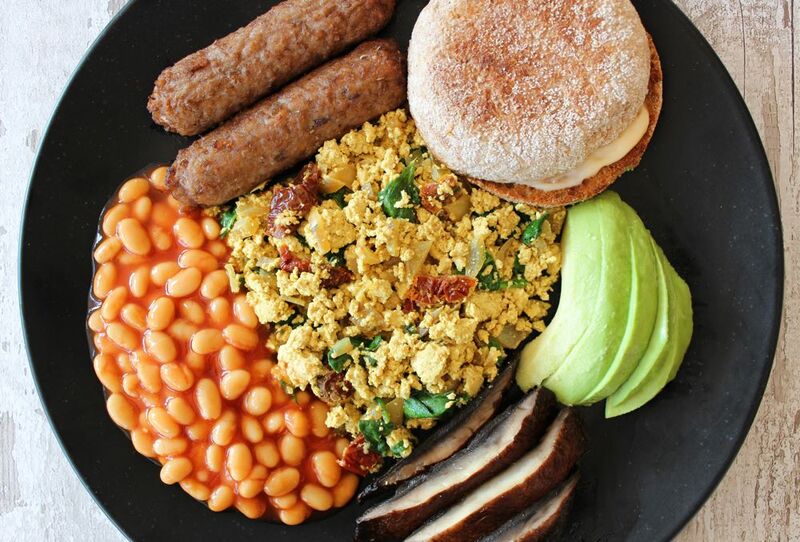 The scrambled tofu, beans, muffins and avocado can all be prepared while the sausages and mushrooms are cooking in the oven. Once they’re done, everything is ready to be be plated up. 1. Pre-heat the oven to 200C (180C fan) / 400F. In a wide, shallow roasting pan, combine the olive oil and balsamic vinegar. Generously coat the mushrooms in the oil and vinegar mixture, either using a pastry brush or your hands. Arrange the mushrooms in the pan upside down. Cook for 10 minutes then flip the mushrooms over, and continue cooking for a further 15 minutes, until the mushrooms are tender and well browned. 3. Cook the sausages according the instructions on the packet. Heat the oil in a large non-stick frying pan (skillet) on medium heat and cook the onion and garlic for a couple of minutes. Crumble the tofu into the pan. Sprinkle the turmeric on top and stir until the tofu has turned yellow. Add the cumin, soy sauce and sun-dried tomatoes to the pan. Cook for 3-4 minutes, stirring now and then. Stir in the milk and continue cooking for 2-3 minutes. Finally, add the spinach and cook for a further minute (until the spinach just starts to wilt). Season with salt, to taste. 5. 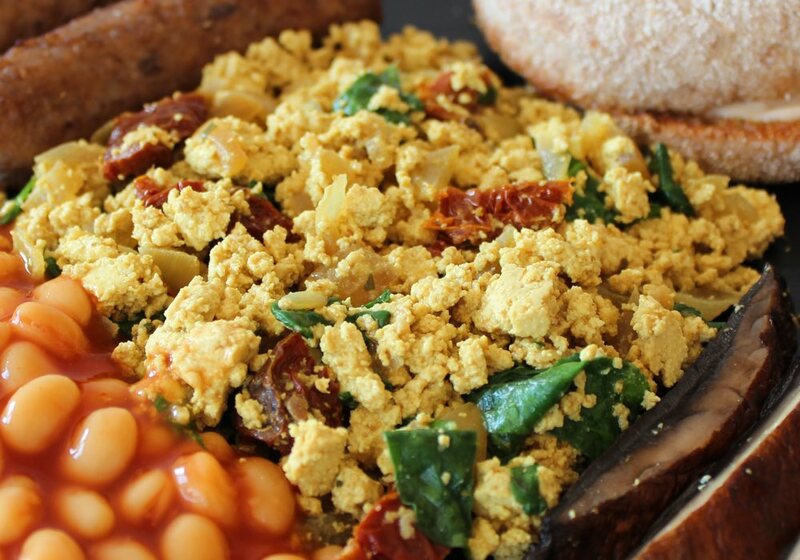 Keep the scrambled tofu on low heat while you warm up the baked beans and toast the muffins. 6. 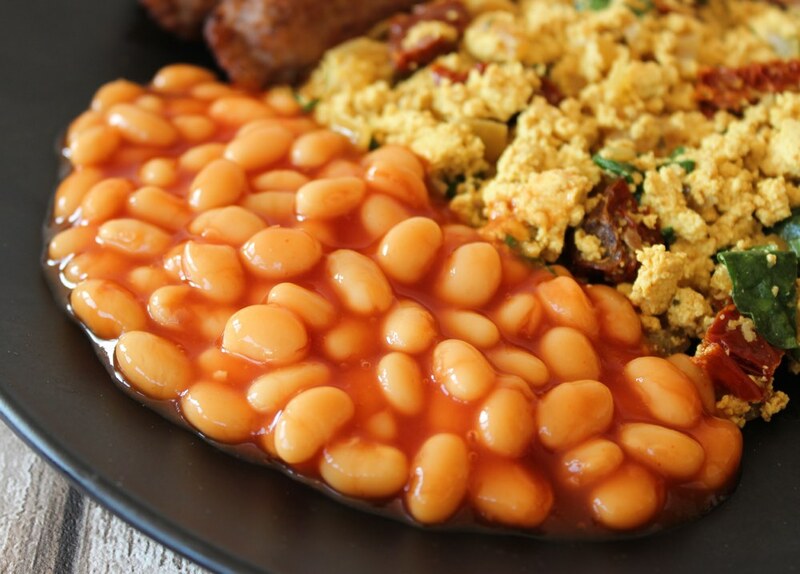 Arrange the sausages, mushrooms, scrambled tofu, baked beans, muffins and avocado slices on plates and serve. Any leftovers make a delicious ‘all-day breakfast’ sandwich, stuffed into a pitta bread or tortilla wrap. 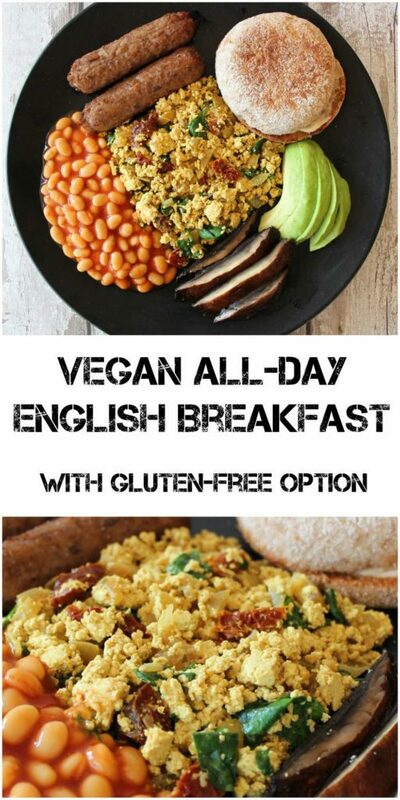 To make the breakfast 100% gluten-free, the muffins could be replaced with a gluten-free alternative, such as hash browns or mini roasted potatoes. Also, be sure to use tamari soy sauce, as regular soy sauce contains wheat. If you make this recipe, I’d love to hear your feedback and any suggestions for adaptations. Tag your photos with #bitofthegoodstuff on social media and they’ll find their way to me. You can also connect with me on my social media channels here: Instagram, Twitter, Facebook, Pinterest. This really sounds like my kind of breakfast. I have been wanting to try Linda McCartney’s products ever since I heard of them several years ago. Hope they arrive in the states really soon. We occasionally have this for dinner too. 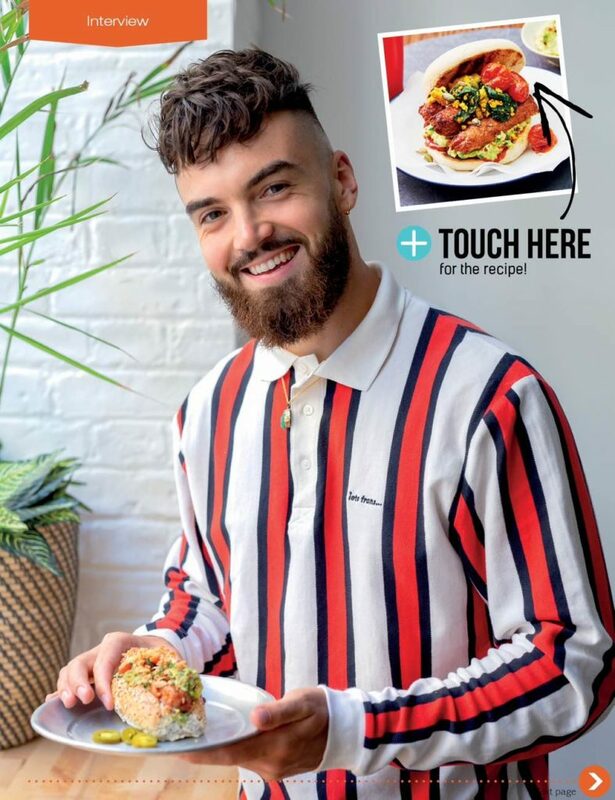 This looks so delicious and wholesome!! Perfect for vegetarians like me! !